A 43-year-old patient has been on the ICU for ten days following a heart transplant for myocarditis. He required central V-A ECMO at the time of surgery due to right ventricular dysfunction and was subsequently reconfigured to a bi-femoral access and return cannula. He subsequently had bleeding from the return cannula site and was taken back to theatre for a right-sided subclavian artery return line insertion. Q1. How is subclavian artery ECMO cannulation performed? Cannulation of the distal subclavian artery with the use of a side graft is the most common approach1,2. This is generally performed in the operating theatre. An incision is made below the clavicle in order to expose the right subclavian artery. The risk of distal ischaemia is minimised by creating an end-to-side anastomosis using a Dacron graft, which is then sutured to the artery3 (see figure 1). The tunnelled ECMO cannula is then secured to the graft1. Similar side-graft perfusion techniques have been described for the femoral and axillary arteries. Q2. Outline the advantages of subclavian artery return in comparison to femoral artery cannulation? The main advantage of upper body cannulation is to facilitated physiotherapy in an awake patient requiring V-A ECMO support for several weeks4. Used in combination with an internal jugular access cannula the patient can mobilise and avoid many of the complications associated with immobility on the ICU5. The graft connection is also thought to be more durable than direct cannulation of the artery where bleeding will occur over time with movement. In addition, subclavian artery cannulation potentially avoids many of the risks associated with femoral cannulation, such as poor upper body oxygenation (differential hypoxia, or Harlequin syndrome: see Everything ECMO 007: What is different about hypoxia on V-A ECMO? ), distal limb ischaemia and retroperitoneal haemorrhage6. Using the subclavian artery as an alternative cannula site may also be useful in patients with peripheral vascular disease or who have coexisting abdominal or iliac artery aneurysms7. Vessel injury rates may be lower for upper limb cannulation than for femoral8,9, however much of the literature in this area has investigated axillary artery cannulation rather than subclavian. The collateral blood supply around the shoulder area is thought to mean a lower risk of distal limb ischaemia when compared with femoral access7. Q3. What are the potential complications of subclavian artery ECMO return cannulation? Unpredicted bleeding complications around the graft side from subclavian return cannulas are the main limitation in our experience. 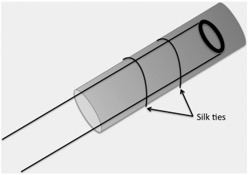 A retrospective study in 148 ECMO patients from 2017 found that surgical/ cannulation site bleeding was higher in patients with side-graft perfusion when compared with peripheral cannulation (n = 18, 24.7% vs n = 9, 12%; p=0.05)10. A case series of 20 patients with subclavian artery return described vascular site complications as occurring in three patients. Only one of these was documented as cannula-site bleeding2. Another potential problem associated with subclavian artery return cannulation is hyper-perfusion of the right upper limb. A paper from 2017 found a much higher rate of hyperperfusion in the side graft group when compared with peripheral cannulation (30.1% vs. 2.7%; p=0.0001)10. Hyper-perfusion can be minimised using certain surgical techniques (see below) but it is important to be vigilant for this complication in patients with upper limb return cannulation. Other potential risks of subclavian artery cannulation include dislodgement of the cannula during ambulation, subclavian vein thrombosis and impaired return flow from right arm movement4. The patient has a right radial arterial line in-situ. Arterial blood pressure is measured as 40 mmHg higher in the right arm than the left arm. Q4. What is the reason for this differential blood pressure? Hyper-perfusion of the ipsilateral upper limb has been reported to occur in up to 30% of patients with subclavian/ axillary return cannulae10,11. This can potentially lead to compartment syndrome11. 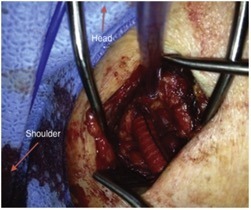 Distal flow through the subclavian artery can be modified through the use of surgical devices, for example through the use of a distal tape and snare device (see figure 3)12. Arterial blood gases should ideally be taken from a left-sided radial arterial line when the right subclavian or axillary artery is used13. Q5. In addition to patients with circulatory failure, what other clinical scenarios are there in which upper body ECMO cannulation may be useful? Subclavian artery cannulation has been described as an awake procedure and a case series has been published on the use of this technique in patients with severe pulmonary hypertension requiring haemodynamic support as a bridge to transplant or recovery3. In this situation, the patient’s underlying lung disease may mean a higher risk of differential hypoxia with femoral return cannulation. Q6. In summary, what patient groups are likely to benefit from a subclavian artery return cannulation in V-A ECMO? Patients who cannot be cannulated with a femoral cannula (e.g. vascular abnormality, failed cannulation (haematoma).